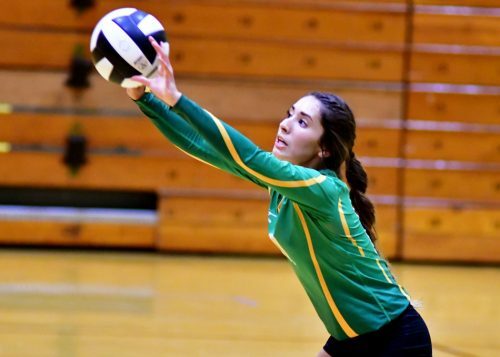 AKRON – Tippecanoe Valley volleyball head coach Mallory Eaton has expected greatness from her team. She’s finally seeing it. 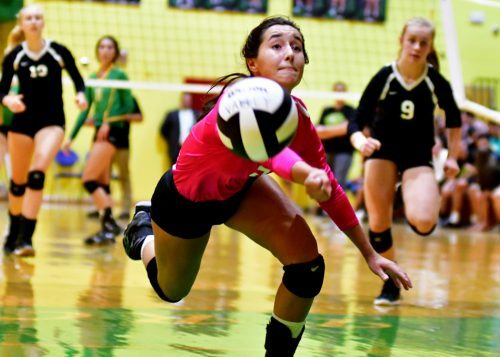 The Lady Vikes shook off some early mistakes to turn around an impressive 3-0 win over Manchester Thursday night in Three Rivers Conference play. Manchester libero Emma West dives to attempt a save of a rally. Valley, playing in front of a huge crowd on the court of this year’s sectional, withstood four early ‘netters’, what the team terms service errors into the net. At 11-8 Manchester in the first game, it looked like a prototypical four or five set TRC grinder. 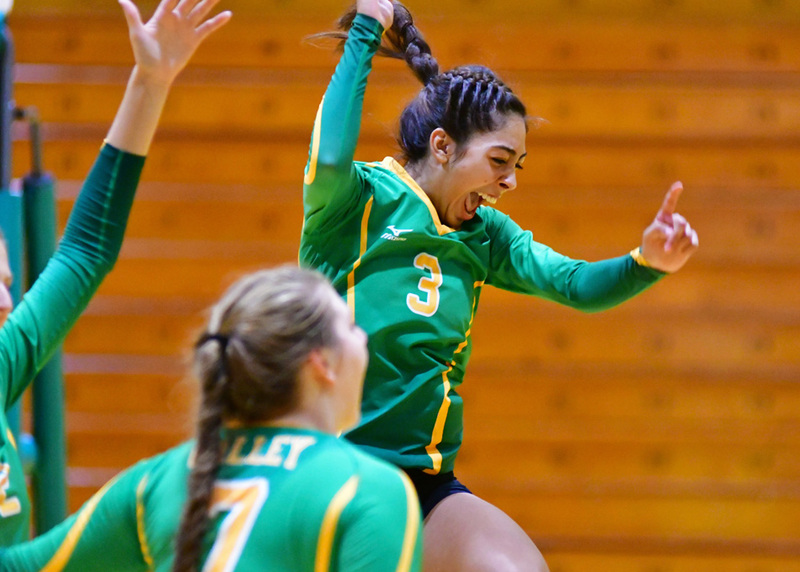 Valley, however, won six straight points to claim a 14-11 lead and took advantage of some unforced Squire errors to rattle off 11 of the final 17 points to get game one at 25-17. The tide had fully turned. The lack of height on the Squire side became glaringly evident in the final two games. Hammers from Sophie Bussard and Makenzie Woodcox exposed Manchester at the net, the Squires missing middle hitter Kyrsten Eakright to potentially a season-ending ankle injury, along with a case of the flu in another, forcing a shuffled lineup to have to make hay. Jumping out to a 14-5 lead in game two, Hannah Engstrand fired an ace to get Valley up 19-7 and served Valley to 24 before closing out a 25-10 game two. Another white-hot start in game three had Valley up 14-3 in much of the same manner as game two. Manchester’s defense looked like an ant colony smelling Raid coming down the line, scattering all over the grid trying to make due. The play of Emma West and Ali Sites on the back line did what they could despite a 25-15 finisher. Hannah Jansma passes to set up the Viking offense. Bussard was again the catalyst for Valley with 15 digs, 13 kills, three aces and two blocks. Sara Myers had 12 assists. Valley has won eight of its last nine matches to move to 12-7 overall with what Eaton said is the toughest of its schedule out of the way. In the JV game, Valley (15-5) survived the roller coaster in a 25-10, 25-24 win. Down 21-16 in the second game, Valley rallied to tie it at 23, then had to battle back from 24-23 down to win it on a kill from Hannah Backus. Mallory Durkes led Valley with six kills and two blocks, while Brayden Baney had 14 digs and Macy Kirchenstien had 14 assists. In the C game, Valley (6-0) made quick work in a 25-6, 25-14 win. Alexis Evans had 14 digs, Durkes had six kills and Ashley Butler had 16 assists. 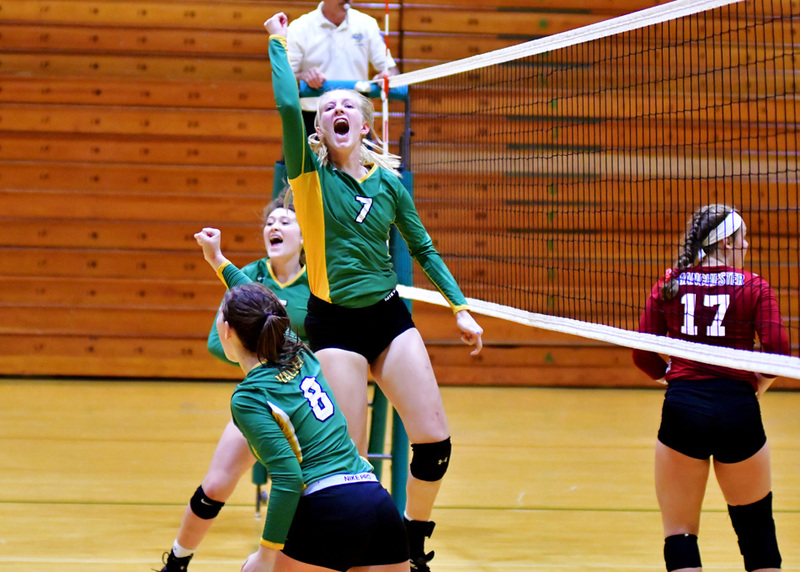 Manchester (10-7, 3-2 TRC) will play again Saturday at the Leo Invite. Valley (12-7, 3-2 TRC) will have a week off before facing TRC foe Northfield next Thursday. Hayley Backus (7) of the Valley JV celebrates the final point of a 2-0 win against Manchester.